Winners of the University of Colorado at Boulder 2010 Alumni Association Awards will be recognized at 7 p.m. May 5 during a ceremony in the Old Main Chapel. The awards recognize outstanding achievement and contributions by students, faculty, staff and alumni of the community. Laurence Boxer, Hank Brown, Richard Knowlton, Julianne Steinhauer. The George Norlin Award honors alumni for distinguished lifetime achievement who throughout their lives have demonstrated a commitment to excellence in their chosen field and a devotion to the betterment of society and their community. 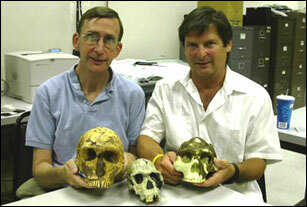 John Cumalat, Richard Noble, Ric Porreca, Robert Schulzinger. The Robert L. Stearns Award recognizes outstanding members of the currentCU-Boulder faculty and staff for exceptional achievement or service for teaching, service to the university, work with students, significant research or off-campus service to the community. Joanne Arnold, Woody and Leslie Eaton, Clancy Herbst. The Alumni Recognition Award honors alumni who celebrate the Forever Buffs tenets of engaging, contributing and celebrating their CU pride through their extraordinary service to CU-Boulder. Nick Sowden. The Kalpana Chawla Outstanding Recent Graduate Award recognizes alumni who have made exceptional contributions to their field as well as significant contributions to the community and/or the university within 10 years of leaving CU. Mary Judd. The Leanne Skupa-Lee Award honors the most effective volunteer representative of the National Admissions Assistance Program. Wynne Adams, Mindy Bridges, Melissa Khat, Bryant Mason, Heidi Mayer, Austin Rempel, Mercedes Ruiz, Denise Weber. The Public Interest Internship Experience Award aims to encourage civic leadership by promoting internship opportunities and supporting students interested in bringing about change in the public sector. This year marks the 80th anniversary of the awards ceremony: The George Norlin Award was presented for the first time in 1930. A reception will follow the ceremony in the CU Heritage Center, third floor of Old Main. The event is open to the public; guests may RSVP by contacting Ryan Lecky at the Alumni Association at ryan.lecky@colorado.edu or 303-492-0635. 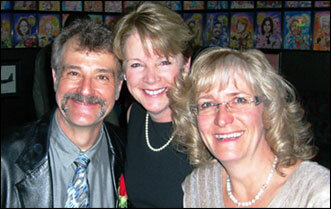 2010 Nightingale finalists (left to right) Darryl Evertsen, Deborah DeVine and Tracy Steinberg. Three University of Colorado Hospital nurses were named finalists for the state's 2010 Nightingale Award for Excellence in Human Caring. Nominees are Deborah DeVine, R.N., M.S.N., director of patient services; Darryl Evertsen, R.N., medical intensive care unit and outpatient post-anesthesia care unit; and Tracy Steinberg, R.N., M.S., C.N.S., liver transplant coordinator. Winners will be announced at a statewide event May 1. "I am proud of all our nominees," said Carolyn Sanders, chief nursing officer and vice president of patient services. "They have exemplified the excellence in caring our nurses demonstrate each day." Founded in 1985, the Nightingale Award honors nurses who exemplify the high standards of care established by 19th-century nursing pioneer Florence Nightingale; 15 regional finalists are selected. Last year, Sue West, R.N. and UCH director of clinical excellence and patient safety, was one of the winners. Sandy Hicks, assistant vice president and chief procurement officer for the University of Colorado, was elected president of the National Association of Educational Procurement (NAEP). Hicks is responsible for directing all phases of purchasing and payables operations at CU's multicampus system. Founded in 1921, the NAEP is based at the University of Maryland Baltimore County. More than 4,000 procurement professionals representing 1,400 educational institutions are actively engaged in the association, which is dedicated to professional development, community development and collaborative development. The work of two University of Colorado at Colorado Springs professors is featured in the Science Magazine article, "Did working memory spark creative culture?" in the April 9 edition. Tom Wynn, professor of anthropology, and Fred Coolidge, professor of psychology, are featured in the piece detailing their decade-long partnership that led to a theory of a new type of memory – working memory – as well as theories about human evolution. Wynn and Coolidge believe humans have an enhanced capacity to hold and manipulate information while carrying out specific tasks. This ability, called working memory, is considered essential for language, planning and other conscious experiences including art. The theory represents a shift in thinking that is making a splash in academic circles. "Current Anthropology" is planning an online supplement devoted to the subject and Wynn and Coolidge will present this month at a meeting on the evolution of language in the Netherlands. 2011 conference in Istanbul, Turkey. ... Joni Dunlap, University of Colorado Denver associate professor in the instruction, learning and technology program and faculty fellow for teaching in the Center for Faculty Development, will receive the Pearson Excellence in Online Teaching award during a ceremony today. The award is presented to educators using the Pearson LearningStudio platform who demonstrate a significant commitment to quality in online education. Pearson also will make a donation of $1,000 to an existing scholarship fund. ... Jason Ren, assistant professor of civil engineering at the University of Colorado Denver, was awarded a $24,998 grant from the EPA Pollution Prevention Source Reduction Assistance program. His proposed pilot project will develop a microbial fuel cell reactor for direct waste-to-electricity conversion for the Colorado Convention Center. 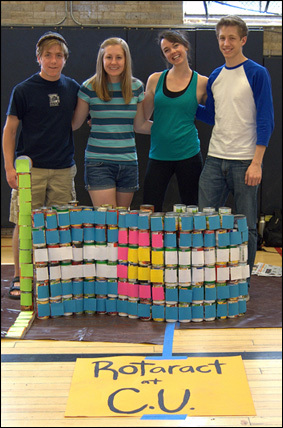 From left, John Usery, Erika Peterson, Genevieve Smith and Philip Terry, members of the University of Colorado at Boulder's Rotaract club, pose with a canned-goods sculpture of the state flag created at the Buffalo Can Challenge on Friday, April 9. Rotaract is a collegiate version of the Rotary Club, a community service organization. 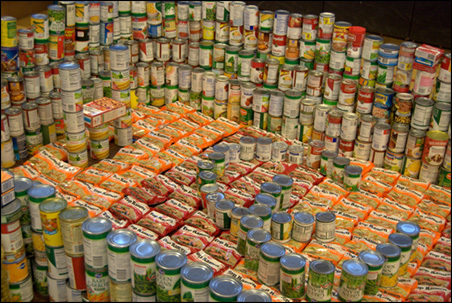 At the Buffalo Can Challenge on Friday, April 9, the Greek Life group used its collected canned goods and nonperishables food items to build a model of CU-Boulder's Folsom Field. The Buffalo Can Challenge, hosted by the Volunteer Resource Center, hopes to spread awareness of hunger in Boulder and Broomfield counties; according to the center, the counties are home to more than 50,000 people living in poverty.